Andy Staats is the creator and writer behind Andy Watches Movies, one of the first review blogs I ever discovered after starting Rorschach Reviews. Hailing from Chicago, Andy’s mission statement is the documentation of his quest to watch and review 300 movies in 2012 (of which he has currently worked his way through 211). Rorschach Reviews: Why did you decide to start a movie blog? Andy Staats: Originally I just wanted to keep a tally of the number of movies I watched in a year. In my head, I then made my goal of 300 movies which I thought was probably not too far off of normal. I had always talked with my dad about all the movies I watched and he passed away in January and I had no one to really talk to about all the movies I had just watched so I decided to start a blog briefly going over the movies just as if I were having a conversation with my dad. I officially started AndyWatchesMovies.com in early March of 2012. As I began to write more about movies, I decided to bulk up my tally spreadsheet and now I’m tracking all sorts of stats on my movie watching habits. RR: I’m sorry to hear about your dad, but it’s great that you found such a constructive response to such a tragic event. Even the most avid moviegoers would say that 300 movies in a year (nearly 1/day) is a good amount to watch, but actually reviewing 300 movies is on a completely different level. With that amount of constant analysis do you ever feel overloaded? AS: Thank you. Actually, no I’m still on track to make it to 300. When it was cool out early this year I didn’t mind staying in and watching movies – in fact, I almost prefer it. Reviewing them doesn’t add too much extra effort either. The biggest thing for me to keep up with is reading all the other blogs I follow. I hate falling behind. RR: Discovering other reviewers is definitely a huge part of the blogging process. Have you ever read a review that made you really reconsider your original opinion of a movie? Feel free to give an example if you like. AS: That’s a very good question…There have certainly been film reviews I read that differ from my opinion and oftentimes I am wondering if there was something I missed when I watched the film myself. It never makes me reconsider my opinion, I have never changed a review score based on this mentality, but it does make me consider giving the film another shot with a different frame of mind. 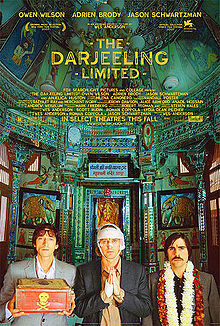 The most recent example I can think of is Mark of Marked Movies (mrmarakai.wordpress.com) has convinced me to give Darjeeling Limited (a film that I fell asleep watching the first time around) another shot. AS: It’s kind of like asking a parent who their favorite child is! 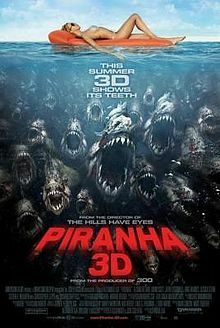 I do like adding humor to a movie review, the recent example being Piranha. Since I take the review about as seriously as the movie takes itself, it results in a fun but not very technical review (just like the movie). Reviews like that don’t happen very often, but they are fun to write. RR: I’ll be sure to check it out, humor’s always been a difficult thing for me to force into writing but it’s a lot of fun when it fits in naturally. Before we go, you’re now into the final centennial of your 300 movie goal. What comes next for Andy Watches Movies once that number is reached? AS: Oh man, I’ve been asked that several times this year and I’m still trying to figure out what I want to do. Obviously, if I don’t make my goal of 300 then I’m going to try that again but the optimist in me thinks I will pass it with ease. Maybe I can really go for broke and try 350 or even 365 (gasp!) but I may try something totally new as well. I guess you’ll just have to wait and see! Thanks for having me for this interview, I had a lot of fun partaking! You can catch up with Andy over at http://andywatchesmovies.com/. Stay tuned for my upcoming reviews of Looper, Solomon Kane and Hotel Transylvania later on this weekend. This entry was posted in Blogger Interviews and tagged Andy Watches movies, blogger interview, darjeeling limited, marked movies, movie review blog, movie reviews, piranha. Bookmark the permalink. Here is my interview with Rorschach Reviews – Check it out! Nice interview and it’s always nice to get to know a fellow movieblogger a bit better. Always like reading Andy’s reviews and shining a spotlight on his blog is a great thing to do. Nice interview guys and Andy is certainly deserving of praise. What he’s achieved I’ve there is very impressive. i “met” andy online somewhere around april after one of us had read film review by the other after we had both attended the 2012 “ebertfest,” roger ebert’s annual film festival. our taste in film is not far off, although i can’t possibly compare to the number of reviews that andy produces. i like that he doesn’t just review new releases but tackles as many older films from various decades. but i guess if you’re going to aim for 300, you can’t only review new releases. if i have to find a criticism of andy (and of course i don’t, but i also don’t want to inflate his ego to where mine is) i’d say he sometimes goes easy on a film when he really could rip it apart. i guess that means he’s a nice guy as well as talented with a keyboard. 300 new releases a year would be hard on time consumption but even harder on your wallet. I currently catch about 3 per week in theaters which is still a lot for me but only would make half of that. My website has a lot of exclusive content I’ve either authored myself or outsourced but it seems a lot of it is popping it up all over the internet without my permission. Do you know any techniques to help prevent content from being stolen? I’d truly appreciate it.